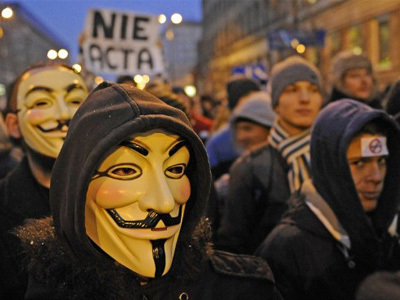 The world has witnessed an unprecedented day of protests against ACTA. Hundreds of thousands of people have gathered in dozens of cities around the globe to protect what is left of the freedom of expression on the internet. ­Protesters from over 200 European cities consolidated their efforts to hold rallies across Europe. The controversial ACTA treaty was signed by the majority of European countries and now there is a battle to dissuade parliaments from ratifying the agreement. Massive strikes took place in Germany with organizers saying that a total of some 100,000 people have gathered in many cities across the country, including Berlin, Hanover, Hamburg, and Cologne. Just the previous day Germany put on hold its joining the ACTA treaty after its Justice Ministry decided to wait until the issue is discussed in the European parliament. Demonstrators protest against ACTA in Paris. ­In Lithuania’s capital, Vilnius, despite the freezing cold, hundreds of protesters rallied in front of the government buildings. 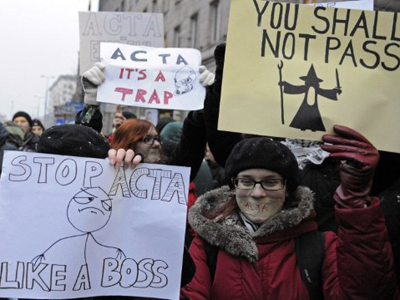 Lithuania is one of the EU countries which signed the ACTA agreement, and the protesters are demanding that the government calls off its ratification. A reasonably large protest was staged in Malta’s capital, Valetta, where more than 500 young people gathered to urge the state’s parliament not to ratify ACTA. About 1,500 people gathered in the capital of Estonia, Tallinn, while several hundred staged a protest in the university city of Tartu. 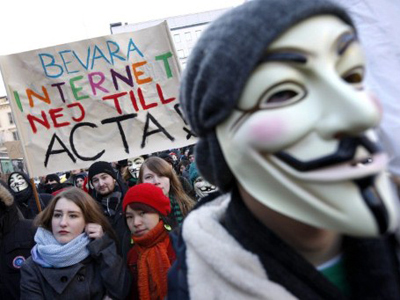 The earlier mass discontent over ACTA in the streets and on the Internet has already delivered some tangible results. Some EU countries, including Poland, Slovakia, Czech Republic, Latvia and Germany, have decided to halt their joining processes until the European parliament reaches an agreement on the issue in June. 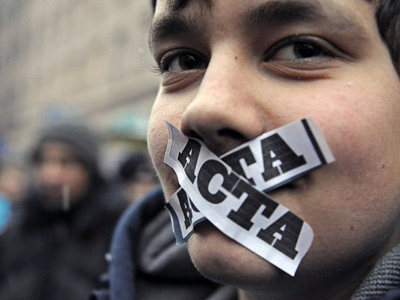 Last month massive rallies took place in Poland and the Czech Republic, as the countries signed the ACTA agreement. On January 26, the controversial ACTA treaty was signed by the 22 of the 27 European Union member states (excluding Germany, Cyprus, Estonia, the Netherlands and Slovakia), and the EU itself. So far ACTA has been signed by a total of 31 countries across the globe, but none of the signatories have yet ratified it. To come into force ACTA needs to be ratified by at least six countries.